Peach pie is one of my favorites and peach season will be here before you know it and I'm ready. While I love baking pies, so many of my friends don't. They say they can't....but I know they could if they tried. Nothing really good comes without practice...and no one is looking for perfect...just yummy. I know you can do it! The season of fruit pies is here. 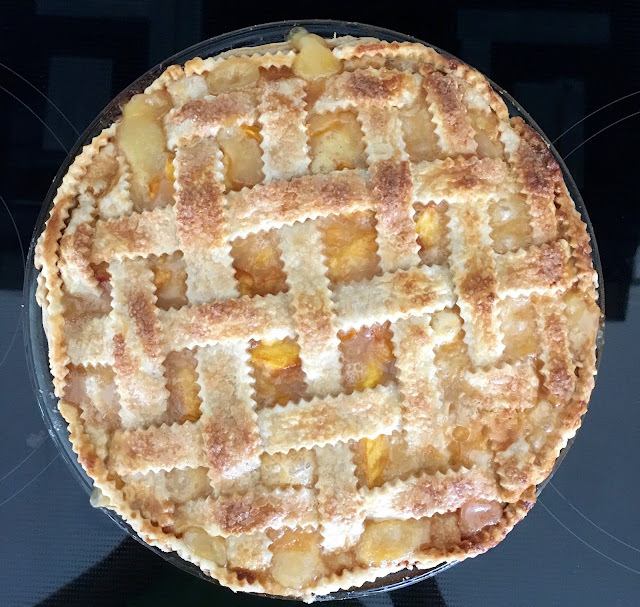 While blueberry pie is often identified by the little circle cut into the middle of the top crust, I think a peach pie with a lattice top is 'peachy'. In a large bowl stir together flour and salt. Grate or cut in shortening with two forks or a pie cutter, until shortening is very small pieces. Add water and stir dough until it begins to come together. Using your hands quickly and as little as possible pull the dough together and turn out onto a lightly floured counter. Pull together into a ball. Divide into two and lightly flatten each piece. Sprinkle counter with flour and roll out one piece of dough to fit into pie shell. For top crust, either roll out another solid piece of dough and use as a complete top crust or roll out and cut into 3/4" strips. Once you have your filling (recipe below) in the pie, lay and weave the strips under and over each other. Peel and slice fresh peaches. Beat egg until frothy and fold into peaches. Stir together remaining ingredients and gently stir into peach and egg mixture. Bake in 375ºF oven for 55-60 minutes or until pie filling is bubbly and crusts are golden brown. Make sure you check to see that the bottom and top crust are baked. Nothing worse than a soggy bottom crust. That is why it's good to use a clear glass pie plate so you can really see your crust. That pie looks just peachy!!! Yum. I too like the tip of buttering the pie plate before lining it with the pastry. Waiting for the local strawberries to start here. Looking forward to peach season as well. Peach pie is my absolute favorite! The butter on the bottom of the pie plate is a great tip! I'm going to try it when I make this delicious looking recipe.